Latitude25 is meticulously designed by the Nikenbah Constructions Pty Ltd team, working with an extraordinary line up of development professionals, all passionate about creating a high-end quality lifestyle community, like no other! Award-winning local builder PBS Building, with over 25 years experience in construction and property development, has delivered some of Hervey Bay’s most iconic projects including the WetSide Water Park, Fraser Coast Culture Centre, Hervey Bay RSL, Hervey Bay Hospital and the Boat Harbour Place to name a few. Award-winning development team Bisa Property has over 40 years of development and construction experience across the full property spectrum including residential apartments, hotel and hospitality including commercial projects. They bring together their success and design experience to deliver on a state-of-the-art Clubhouse & Wellness Centre at Latitude25. 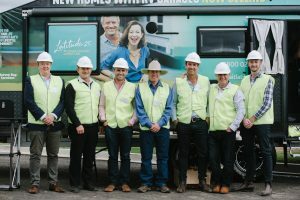 Local land owners, Bullamon Residential Pty Ltd were responsible for creating the vision for Latitude25. With a passion for the RV lifestyle and being RVers themselves, they knew firsthand how to bring about the ideal lifestyle that our Grey Nomad’s dream about. I’m a local and also an RVer myself, so I’ve seen the need for this style of community for quite some time. It feels incredible to finally make the vision a reality. We’re committed to delivering one of the best RV communities Australia has seen to date. Our vision is to deliver a place that truly inspires people to get the most out of life. There are very few places today that cater specifically for active RV travellers. They may have caravan spaces, but that’s it. Where as at Latitude25, every home will have an RV garage. And in a great destination like Hervey Bay, so close to the water, the beach and the marina, our residents will be able to enjoy every aspect of this lifestyle.